It has been raining for a few days now... and yes, we need it. Especially with the amount of fires already raging in Alberta. It isn't snow, so woot woot-- but i'm now in a 'rainy kind of mood' and i'm thinking about food! Warm soup, hot tea, stew, peanut butter toast (say what?)! I can't stop thinking about warm yummy foods! What is your favourite, rainy day food? #Yyc certainly has some of the most terrible weather in all of Canada. But at least there is a view of the mountains, right? Peanut butter toast sister. Peanut butter toast. Peanut butter toast makes me want to go to the kitchen now! Sounds delicious. Did you cook whatever that is in the photo? What is it, looks delicious. I would say my favorite rainy day food is probably casseroles. 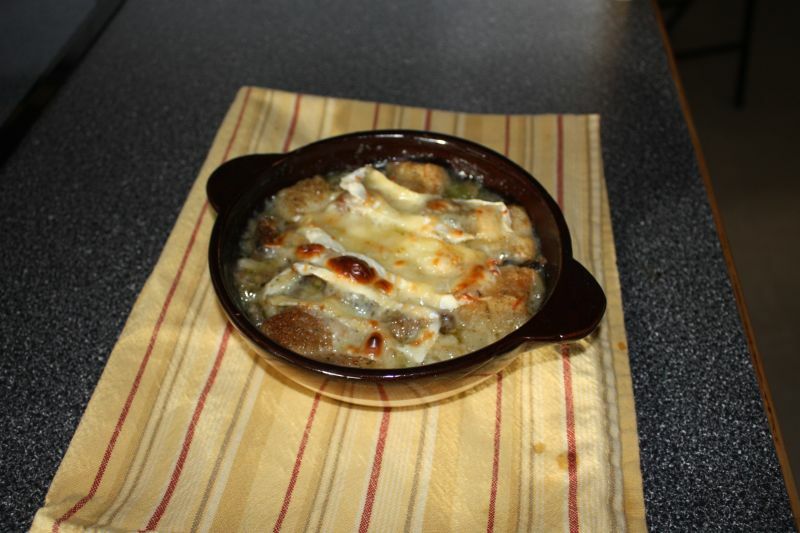 Cheesy, creamy casseroles. I did make it-- home made onion soup. Throw together what you have! Hi! This is Kelly from I've Become My Mother. I am visiting you today to ask for your help in saving the life of a child... Please visit my site and link up to today's post - the link is below. Please post the post on your Facebook. We need to get word out about bone marrow donations... You and others can get tested simply by ordering your free kit and swabbing your mouth - it's that easy to save a life... Please join me to save Haley and others who need our help.. Thank you and God Bless! Last night as we went to bed a major thunder lighting storm all I could think about was soup!! Raining today yeah....better than snow I know. I'm glad you guys are getting the rain as you said you need it. Here in London we are so water logged it isn't funny!